Have you ever given any thought to where those nice, warm, beautiful Angora sweaters and mittens come from? I hate to rain on your parade, but I just watched this undercover video and my heart is breaking for these poor creatures. Have you ever heard a rabbit scream? That’s what they do when their fur gets ripped of their live bodies … every 3 months for several years. WARNING: Graphic content … and screaming. 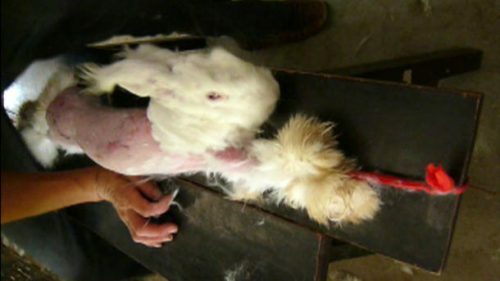 Factory farm workers violently rip the fur off a live rabbit! Imagine the pain, the terror, the shock! I didn’t know a rabbit could scream like that, and I’m sorry that I know now. They’re such soft, gentle creatures and to see this done to them just makes my heart break for them. As you can imagine, and actually see in the video, these animals are likely to go into extreme shock after having their fur ripped out. 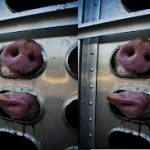 Then they are left in their tiny, dirty cages to suffer alone. 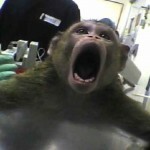 The worse part of this is that they have to go through this torture every 3 months for 2-5 years! 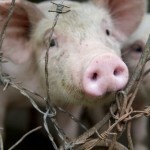 After that, they are hung upside down, their throats are slit, and they are sold for their meat. Rabbits are friendly, social beasts and are definitely not meant to live like this. About 90 percent of the world’s angora comes from China where there are no penalties for animal abuse on rabbit farms, and no standards that regulate the treatment of animals. 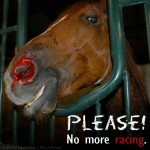 Help stop this cruelty. When you are buying a sweater, please read the label. If it says, “Angora” please don’t support the industry by buying it. Thank you for taking the time to visit my blog. 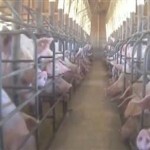 Video Showing Alleged Abuse of Factory Farm Pigs, Bacon Anyone?